Visit Grand Cayman's first and biggest coral nursery and assist with hands-on tasks. This boat dive is a one-tank trip that runs in the afternoon. Includes mini-class. Visit Grand Cayman's first and biggest coral nursery and assist with hands-on tasks. This boat dive is a one-tank trip that runs in the afternoons. Includes mini-class with certification upgrade available. Our East End coral nursery consists of ten coral trees, each with approximately 100 hung coral fragments. The coral tree frames are made from PVC pipes and anchored in to deep sand. Gardening corals in nurseries results in accelerate growth of the corals due to their elevated position and improved water sediment quality. Ocean Frontiers has a permit from the Cayman Islands Department of Environment to operate the Nursery. 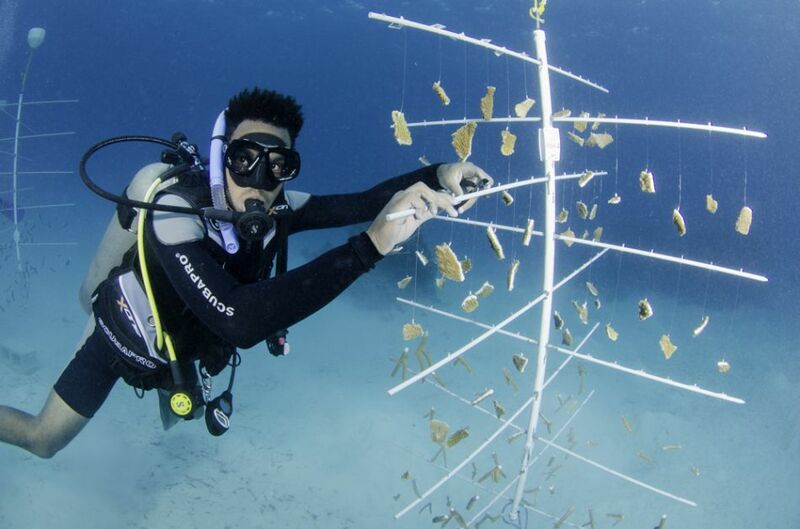 Live coral fragments were harvested from approved healthly reefs. When the coral fragments reach a suitable size they are out-planted back to coral reefs to complete the restoration process of this ongoing conservation effort. Departs East End at Ocean Frontiers Dive Shop dock. Boat Trip, Air Tank, Naturalist Guide, Towel, Drinking Water, Lead Weights, Weight Belt, Free Shuttle. Mini-Class: The coral nursery trip includes an educational session for 45 minutes that includes topics on why we set up a coral nursery, the goals of the project, coral ecology and threats, and how coral nurseries work and which target species are used for propagation. Nursery Dive: The nursery dive is approximately 60 minutes, subject to air consumption. You will tour all areas of the nursery, monitor growth, learn how to clean a coral tree, help with removing algae, and tour the adjacent reef. Maximum depth is 26 feet and is within the East End lagoon, with typically calm seas and no current.